Spending my winter break in SC was a great idea. I finally felt that I could relax and be myself. Which sounds odd, because I should be able to be myself always. Maybe I mean that I was able to unwind and became less frustrated with life, carefree. The picture above is the north side of Pawleys Island, SC, and the picture below is Murrells Inlet, SC. I had to pull my shorts out of the summer clothes drawer while I was there! The week away was a truly beautiful time. My mom and aunt came to help me cook our family holiday treats. I am not a sweets person, but I really enjoy baking and making candy. I think it is kindof like how I like to clean; they both relax me. Mom, Aunt Thelma, and I set shop up in my kitchen. We ended up making my grandmother’s applesauce pies, my aunt’s pecan pies, Aunt Meta’s candy, haystacks, peanut butter cups, and peanut butter coconut balls. My aunt is teaching me how to make my grandmother’s (their mom’s) applesauce pies. Of course, they laughed when I showed the pie crusts I got for them. Apparently, I should have gotten the frozen ones, not the graham cracker ones. Applesauce pies are delicious. You can see them in the oven cooking, and my haystacks took up all the counter space. I tend to unintentionally make the haystacks bigger as I go along. My aunt’s pecan pies cooking away. Her secret ingredient is white vinegar, which takes some of the sweetness away. My Aunt Meta’s candy is pictured above on the right side of the plate. This was my favorite candy growing up. It is chocolate covered white fluff with pecans in it. Fluff being sugar, butter, eagle brand milk, vanilla, more sugar, and something else (probably more sugar). I guess Aunt Meta is technically my great aunt since she was married to my grandfather’s brother. For Christmas Eve dinner, I took my Mom to a restaurant at the Inlet for the sunset view. This was the view from our table. My friend’s son loves the Incredible Hulk, so I found him the cutest Hulk bow tie and Hulk shirt on Etsy. Here is is showing me how the Hulk gets mad. Love the action shot! Mom hates having her picture taken, and asked why I have to take one every time she opens a gift. I try to get her gifts that I know she will never buy for herself, as well as practical stuff. She is opening a gift that is her father’s signature (his last name) made into a gold charm for her charm bracelet. He died when she was in college, and she misses him the same now as when she was a young girl. One year I ordered his Marine Corps records and put them in a book for her. I took his signature from one of the documents for the charm. I ended up ordering myself one in silver. Christmas day was spent with my aunt and part of her crew. Her daughter lives in Hawaii, so she wasn’t there. Mom spent the entire time with the youngest in the family, which wasn’t surprising. My aunt’s son was in town, so I was able to see him and his wife. They just moved to my hometown for his work, and I am not sure how much she enjoys it yet. I asked how she liked it, and her comment was how diverse it was in relation to her her hometown. Yes, we have a bit of everything there! After spending so much time with the family, I needed some time away. Love them, but in small doses. My retreat ended up being a walk on Pawleys Island, and spending time with my friends. The holiday break was the best in quite a while. I was finally able to go down to the beach this past Thanksgiving weekend, and it was very difficult to come back. For Thanksgiving this year I made reservations for a traditional meal for my mom and myself at a restaurant. She lives about an hour from the beach where I used to live, so I picked her up on the way down. First thing I had to do when driving into North Carolina was to pick up a Cheerwine in a glass bottle. It’s the good stuff! The dinner we ate was very good, and we had enough leftovers that we ate on for two days. My aunt came down Thanksgiving night and stayed the weekend with us. Per southern tradition, I drove the ladies to Belk to shop for Black Friday. After shopping, they wanted to relax and find NCIS on TV. I met up with my friend, Dave, and headed to the beach. It was perfect weather, and the entire time I’m questioning why I am still in WV. The beach has always calmed me, and I am seriously planning on moving back. These photos are from Pawley’s Island. Even though I grew up in the mountains, I am a beach girl at heart. I convinced mom to have our Christmas at the beach house, just so I can go back sooner. Dave and I have been friends for ten years now. It took a minute to figure it out, and I didn’t realize it had been so long. It was really nice to see him over the weekend. Later that night I took mom and my aunt to watch him play, and they really enjoyed it. They wouldn’t go on their own to watch musicians play, but since they had such a good time that may change. The venue had rocking chairs outside, and they sat out there to listen. My aunt asked me if he knew the theme song for NCIS. He probably does just from his mom watching marathons of it all the time. She was serious when she asked me. Two of her dogs are named after Ziva and Abby. I originally planned to leave SC on Saturday so I could have one day to relax before work on Monday. I pack up mom and my aunt in her car for their trip an hour north. I made lunch plans with Dave and Jacqui, so I packed everything up in my car and turned off stuff in the house before I left. I fully expected to start my roadtrip back north after lunch. Getting two best friends together who haven’t seen each other in a long time created a long lunch! We all met at Murrells Inlet, and I finally made the decision that I was not going to be leaving SC that day. Why would I leave if it wasn’t really necessary? I promise that Jacqui’s son was excited to see me! Dave took this picture at the Inlet. It really turned out beautiful. I really need to get a new phone. His pictures turned out so much better than mine. It was wonderful catching up with my friends and having an afternoon/evening on the Inlet. Later that night, Dave and I went to see another friend play with his band. Getting up that next morning was rough though. The last thing I wanted to do was drive 8 plus hours north in rain and holiday traffic. Thankfully, I have satellite radio and I jam out (horribly) to the 90’s channel. The 90’s were great! One of my first songs, awesome! Yes, I get looks while I drive during my concert. I sing all out, and I know it looks hilarious. How else am I supposed to stay awake and alert for that long? Sometimes I laugh at myself while I drive, because I know it is humorous. Really I laugh at myself all the time, not only when driving. I’m excited for Christmas now, since I will be heading back to the beach! Coloring in the state of South Carolina on my map of the 50-state travels is easy. My family would head to South Carolina every year for our family vacations. Also, I lived in the state for ten years before moving to WV. As for our vacations… ahh, the road trip itself was enough to need a vacation. First, let me just say that my family were campers. Yes, we went to the beach and camped in a tent at the campground. Actually, we always were camping somewhere. Even in college, I would go camping up in the mountains because that is all my friends and I could afford for entertainment! Our family had a small two door Toyota Tercel, which was a hatchback. Zero air conditioning. Pops would round us up and leave around 1:00 am so we would sleep and it wouldn’t be so hot driving. It was a great idea, except I always had to sleep on the floorboard after they stacked pillows and blankets to fill it up. This was because I was smaller than my brother, so he got to sleep on the seat part. You don’t understand family road trips until you travel without phones, air conditioning, a Walkman (although that did come later), or even bathroom breaks! I think it took us seven or eight hours to get to our destination. I do the same drive now, and it takes me close to six hours. Eventually, we would get to the beach. 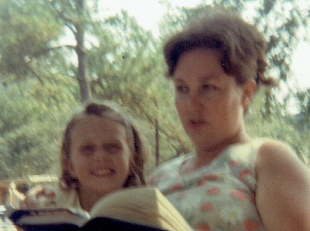 This was sometime in the 1980’s in SC with my Mom. She didn’t want to take a picture. She really wanted me to get back into the pool so she could finish reading her book.